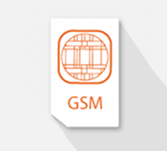 GSM is a internationally accepted standard for digital cellular communications. GSM makes use of narrowband Time Division Multiple Access (TDMA) to provide voice and text based services over mobile phone networks. This tutorial is useful for readers who wish to understand the basics of GSM in very easy terms. This tutorial will provide you sufficient material to get good understanding on GSM from where you can move on to higher levels of expertise. Before starting with this tutorial, users should have some basic knowledge of telecommunications to understand the concepts explained in this tutorial.